YESTERDAY WAS ONE OF THE BEST DAYS OF MY LIFE…I PASSED MY REGISTERED DIETITIAN EXAMINATION!!!! I cannot stop smiling and am so thankful for everyone who was been involved in this journey to becoming a RDN. A big shout out to all of my family, friends, professors, co-workers, and social media friends who have continued to encourage and support me! Tawnie Kroll, RDN – YAY! Besides from that great news…I have a healthy kid-friendly deviled eggs recipe to share with you today. This idea is 100% Pinterest inspired. (But I changed the deviled egg part of the recipe). I thought it was SO cute and knew I had to make them. The process of making them was so fun too – getting the kiddos involved in not only dying Easter eggs, but actually dying the egg whites and being able to munch on them after is super fun! Anything to get the kids involved in the kitchen is a plus, right? To make the process easier you may want to make the hard boiled eggs the day before and then soak the egg white halves in the coloring. If not, the hard boiled eggs only take about 30 minutes and then after they cool you can begin the color dying process! To make the “deviled egg” part of the recipe a little healthier, I cut out the mayo and substituted it with dijon mustard and Greek yogurt. Yogurt has a pretty distinct flavor compared to mayo, so I added a splash of red wine vinegar and Worcestershire sauce. It was DELISH! 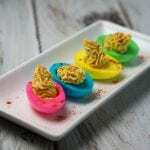 I hope you find time to make these with your family this Easter! Hard boil your eggs. A good video on how to hard boil your eggs is in the notes section below! After you peel your eggs, cut the eggs in half & remove the yolk. Place yolks in a separate bowl. Prepare your food coloring by getting 4 bowls and filling each with 1 cup of water and a splash of cider vinegar. Put 6 drops of food coloring in each bowl. Let egg white halves soak for ~20 minutes or until they reached the color you like. In the meantime, prepare the filling! Using a fork, mash up the egg yolk until they reach an even consistency. Add in remaining ingredients. Taste and adjust seasonings. Using a pastry tube + the tip, fill each egg white half and sprinkle with paprika. Thats it! Enjoy! Congrats on passing the RD exam. I did that not to long ago and it was one of the best days of my life! I love the multi-colored eggs. So cute and appropriate for Easter. Thank you soooo much!! Congrats to you as well! I literally said out loud to myself OMG those are ADORABLE! Yay, congrats on passing your exam!!! I still remember how excited (and relieved!) I was when I passed. 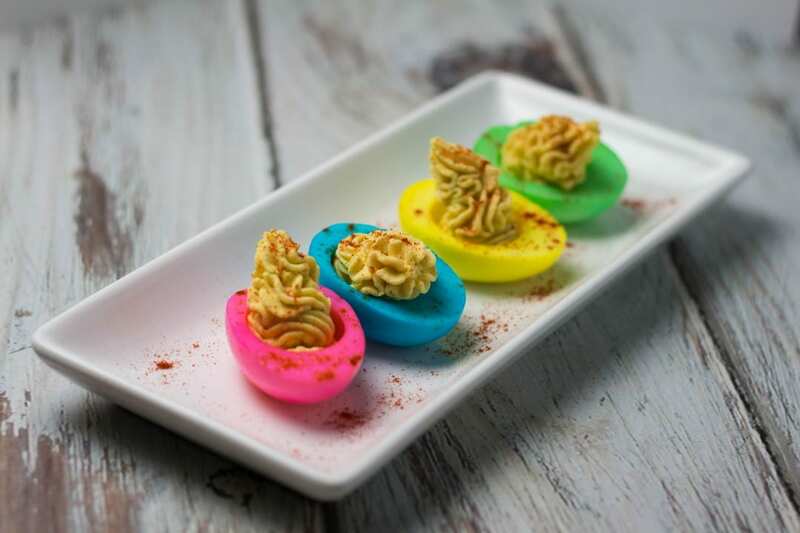 🙂 Those deviled eggs are super cute, I know my kids would love them!